More spots for guys who don’t make the cut in the NFL and don’t want to go to Canada…. 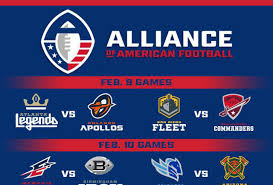 The new Alliance of American Football League is gonna need luck to survive…. They will offer Spring pro football for those who can’t enough sports besides Major League Baseball…. CBS Sports will carry the games…. CBS Sports Network aired a QB Draft with lead analysis from Kurt Warner, for instance, and in that draft, familiar names like Christian Hackenberg, Josh Johnson (who ended up playing for the Washington Redskins in a few games late in the 2018 NFL season) and Aaron Murray were selected as if starting their NFL careers afresh. Those quarterbacks — and countless other players — are actually preparing to suit up for the AAF, a brand new league set to debut on Saturday.